This tutorial teaches how you can build, structure, test and debug a Node.js application written in TypeScript. To do so, we use an example project which you can access anytime later. 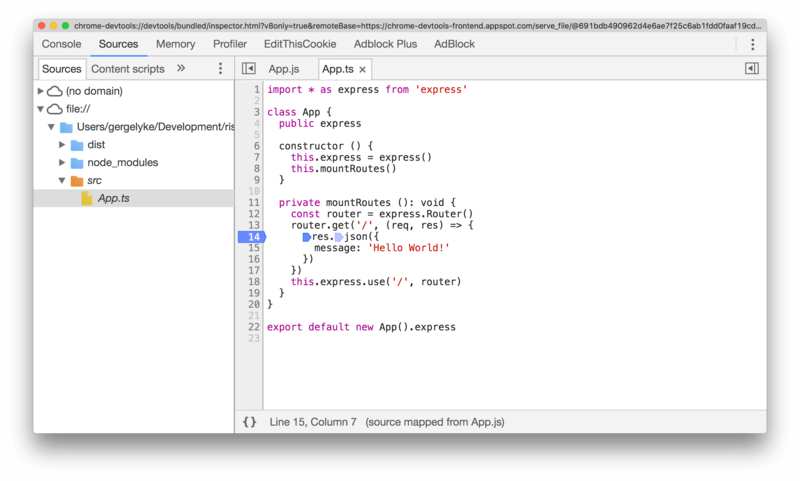 This article won't go into to details of using the TypeScript language itself, it focuses on how you can build Node.js applications using it. If you are looking for an in-depth TypeScript tutorial, I recommend checking out the TypeScript Gitbook. great tooling with instruments like IntelliSense. One thing you could already notice is the string type annotation which tells the TypeScript compiler that the greeter function is expecting a string as its parameter. Let's try to compile it! greeter.ts(10,21): error TS2345: Argument of type '3' is not assignable to parameter of type 'string'. To build applications using TypeScript, make sure you have Node.js installed on your system. This article will use Node.js 8. We recommend installing Node.js using nvm, the Node.js version manager. With this utility application, you can have multiple Node.js versions installed on your system, and switching between them is only a command away. 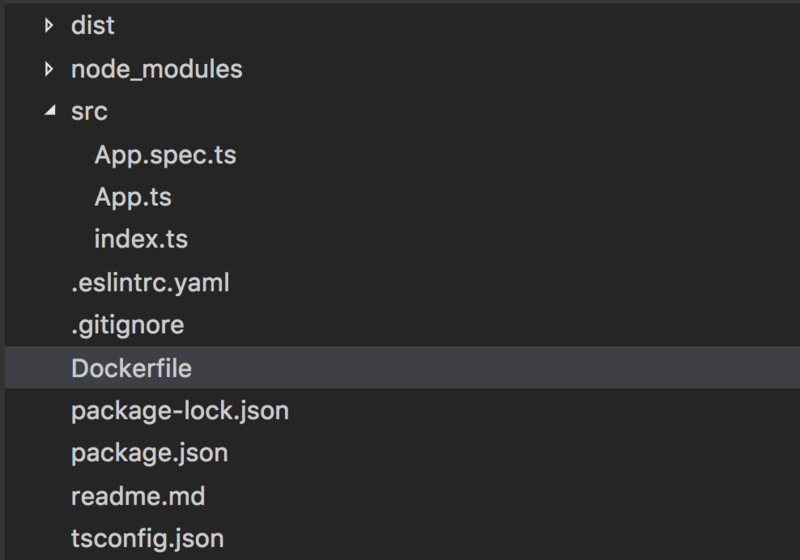 When using TypeScript, it is recommended to put all your files under an src folder. Let's start by adding the App.ts file - this will be the file where your web server logic will be implemented, using express. In this file, we are creating a class called App, which will encapsulate our web server. It has a private method called mountRoutes, which mounts the routes served by the server. The express instance is reachable through the public express property. For more information on how to structure your project, read our Node.js project structuring article. You can pass options to the TypeScript compiler by either by using the CLI, or a special file called tsconfig.json. As we would like to use the same settings for different tasks, we will go with the tsconfig.json file. Once you added this TypeScript configuration file, you can build your application using the tsc command. If you do not want to install TypeScript globally, just add it to the dependency of your project, and create an npm script for it: "tsc": "tsc". This will work, as npm scripts will look for the binary in the ./node_modules/.bin folder, and add it to the PATH when running scripts. Then you can access tsc using npm run tsc. Then, you can pass options to tsc using this syntax: npm run tsc -- --all (this will list all the available options for TypeScript). As with most projects, you want to have linters to check for style issues in your code. TypeScript is no exception. Testing your TypeScript-based applications is essentially the same as you would do it with any other Node.js applications. The only gotcha is that you have to compile your application before actually running the tests on them. Achieving it is very straightforward, you can simply do it with: tsc && mocha dist/**/*.spec.js. For more on testing, check out our Node.js testing tutorial. start the Node.js application from the built source. To actually start the debugging process, open up your Google Chrome browser and browse to chrome://inspect. A remote target should already be there, just click inspect. This will bring up the Chrome DevTools. Here, you will instantly see the original source, and you can start putting breakpoints, watchers on the TypeScript source code. The source-map support only works with Node.js 8 and higher. You can find the complete Node.js TypeScript starter application on GitHub. Let us know in the issues, or here in the comments what would you change!